Let’s go back a bit in time to December and the best time of the year : Christmas. I was of dessert duty for the Christmas dinner, and this is what I baked. I usually bake chocolate truffles at Christmas to give to people, and this year was Almonds and Peppermint flavours. The latter sounded so Christmas-y to me that I thought it would be a great idea for family Christmas get together. I started with this recipe but changed a few things. Mainly because I’m not a huge fan of butter frosting. So I made the cake mint-flavoured instead of the frosting, and opted for a frosting that I love, whipped-cream and mascarpone. For the cake, I simply followed the recipe, but added those mint melts I had along with the chocolate, and tasted it until it was minty enough to my taste. These are mini melts I bought from Hickory farm, it tastes like white chocolate with a mint flavour. Let the cakes cool down. In the meantime you can start on the frosting. Whip your cream until peaks start to form, then add the confectionary sugar according to your taste (I never measure the sugar when I make whipped cream, I just add it until it is sweet enough to me) then add the mascarpone until combined. When cooled down, trim the cakes until flat under and over. Start by putting frosting on the first layer of your cake (my layer cake only had 2 layers) then put the second cake on top and frost the whole thing. 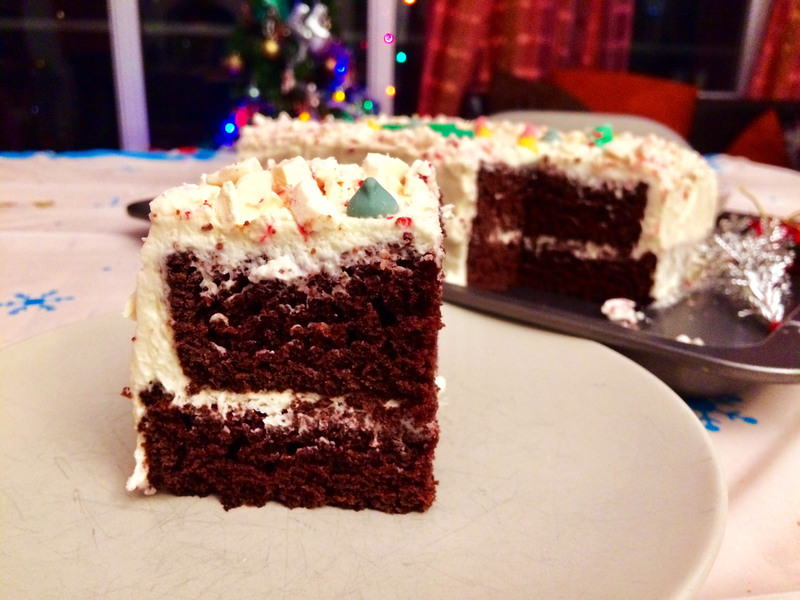 I am not an expert when it come to layer cakes (this is the first one that I succeeded to be perfectly honest) so I’m not going to give you any tip on the frosting part… because I don’t have any! And you can probably tell, my frosting is not horrible but far from perfect.